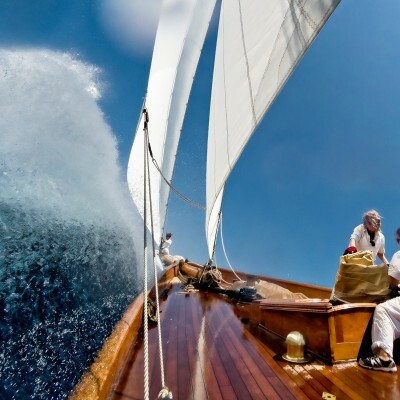 The coast of Barcelona has once again witnessed a unique spectacle of classic sailboats. 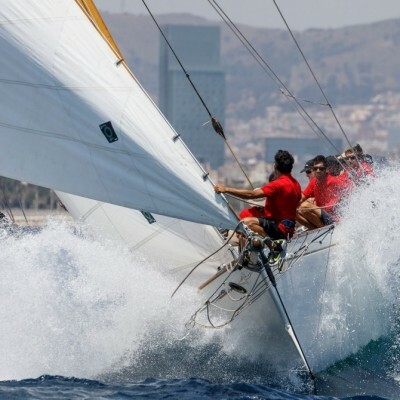 More than 500 sailors of 7 nationalities compete in the Barcelona regatta field. Very evenly-matched classifications waiting for a very tight final tomorrow Saturday. 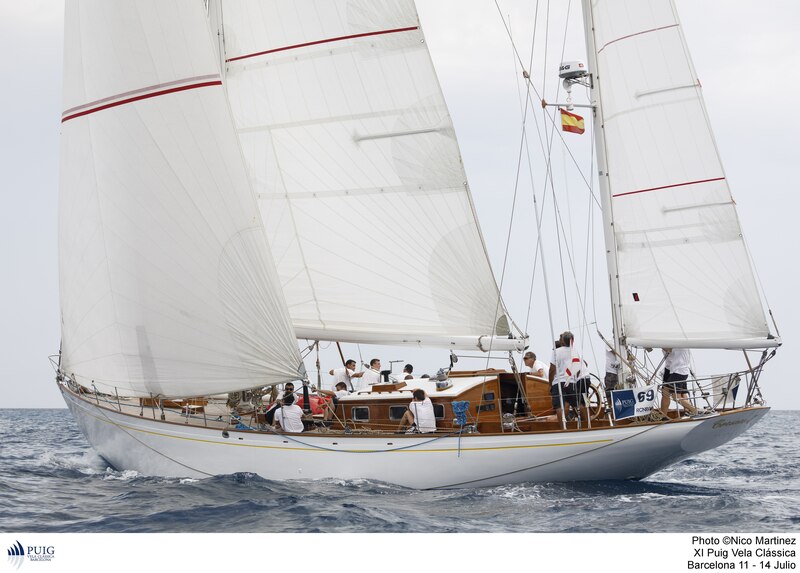 The current leaders are Halloween (Big Boats), Guia (Classics 1), Argos (Classics 2), Peter (Bermudian Époque) and Marigan (Cangreja Époque). 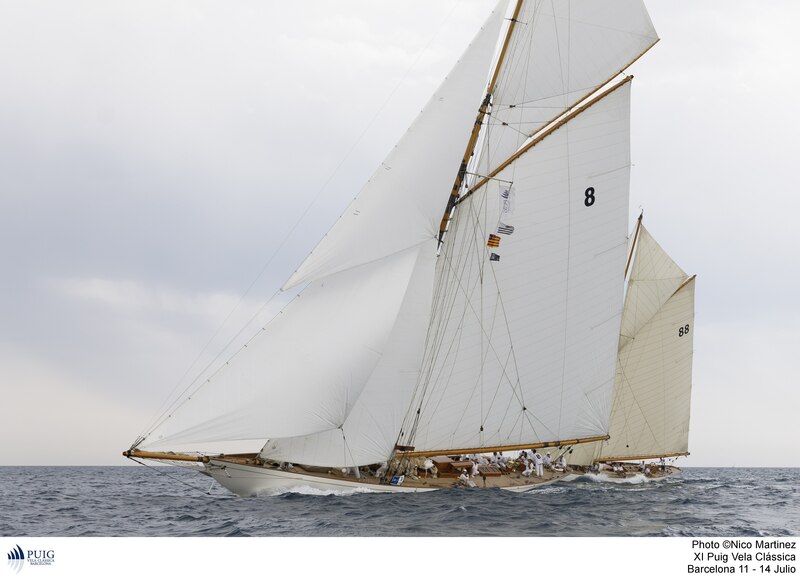 The second day of the XI edition of the Puig Vela Clàssica Barcelona regatta has once again offered a great spectacle on the coasts of Barcelona, reflecting the very high competition level of all crews aboard the most beautiful classic sailboats. It has been a hard-fought day in which the conditions have been less favorable compared to the first race day, with an unsteady easterly wind putting the crews to the test. 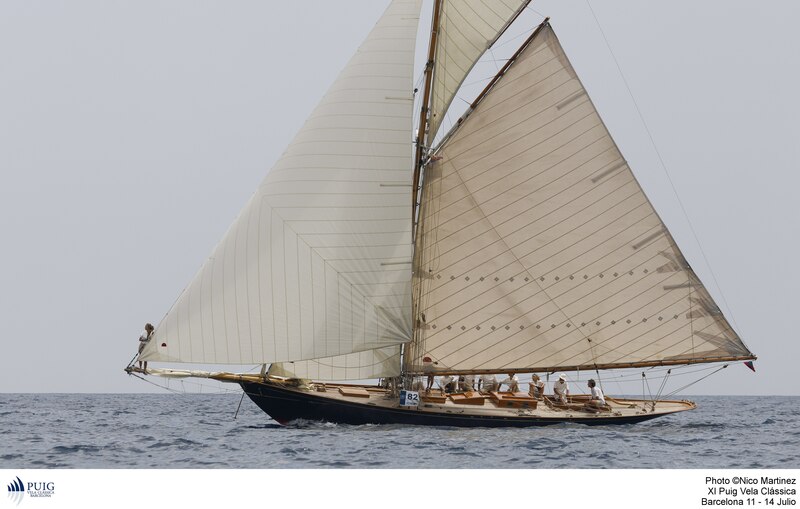 Besides, one of the main attractions of the regatta is that due to the characteristics of the competition the classic yachts sail very close together one another. This allows the crews to have a close look at the navigation maneuvers of their competitors thus creating an evenly-matched competition. After a short delay the race started with the four planned starting shots and a weak easterly wind allowed to kick off for a 16-mile course in five sections, except for the Cangreja Époque class that competed a 13-mile race. The first stretch of tight was especially complicated due to the weak wind, affected by some low clouds that offered some gusts and small air currents. Its around 6 miles length drove the fleet to the point of separating ones from others, according to the different boats sizes and the tactical successes or mistakes. Fortunately, as the race progressed the initial 4 to 5 knots wind force increased, providing some gusts of 10-12 knots, although at the dn of the course the wind lost strength again and became especially capricious. One of the positive aspects of the journey was milder temperature due to the cloudy day, and a calmer sea than yesterday. 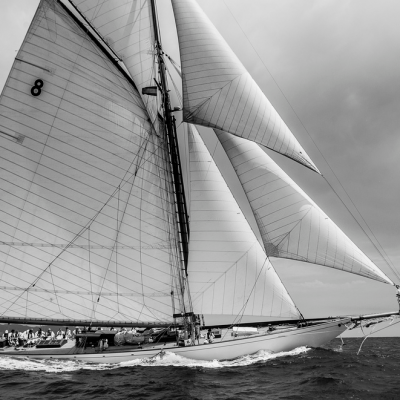 The fleet that suffered the most these difficult navigation conditions the Cangreja Époque one, as only Marigan of Tim Liesenhoff was able to finish the competition, and therefore to score its second victory at this edition. This victory reinforces its first position followed by Gypsy (8 points behind), Freda (9 points) and Bon Temps (10 points), and accredits it as the virtual winner of the category in this XI edition although the rest of the podium positions must be defined in the last race day. Again, Big Boats offered a couple of pearls in their intense duel, with a very tight arrival at the first mark, where Halloween, Moonbeam IV and Moonbeam III, in that order, arrived almost stuck one to the other. In the first section, the Halloween could contain the largest of the Moonbeam making the most of its spinnaker sail. After the second section and after fighting in the buoy located near the coast, they sailed perpendicularly to the keel, getting close and allowing Moonbeam IV to overtake the leader, which was unable to hold its spinnaker sail. In turn, Moonbeam III took advantage of its opportunity to overcome Halloween before finishing this third section and maintained the positions in the last section until the arrival. Time compensation re-confirmed this at the finish line. The general classification after the two contested races is led by Halloween with 3 points, while Moonbeam IV and Moonbeam III tie to 5 points. 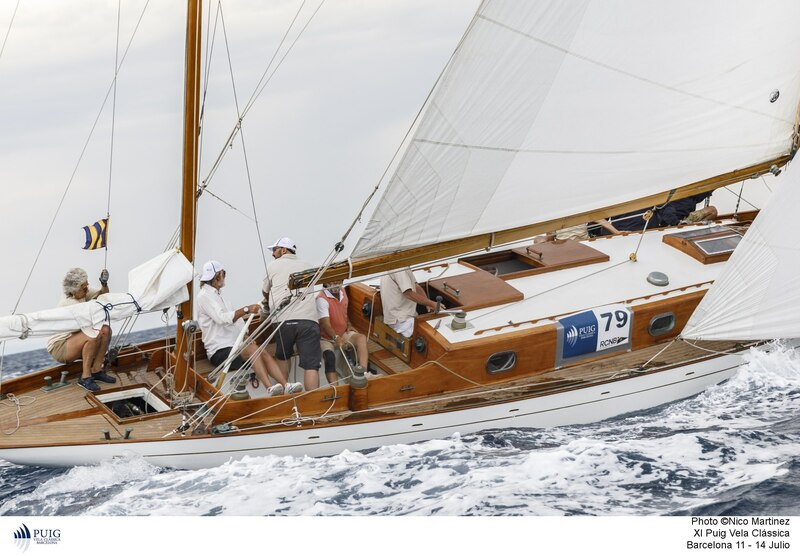 The Italian Corsaro II of the Marina Militare managed to win in the Classics 1 category, beating the French boat Sagtitarius, while the Spanish boats Yanira and Guia were classified third and fourth. After today’s results, the general classification is tight as the first four classified boats are only separated by one point, while Guia and Yanira sum 5 points, Corsaro II and Sagittarius tie to 6 points, with the French boat Emeraude fifth with 8 points. 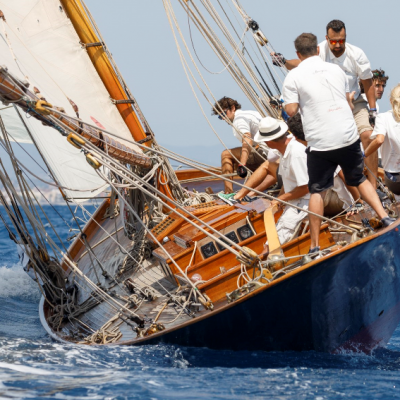 Tomorrow a great sporting duel is expected between them to settle the final podium of the 2018 Puig Vela Clàssica regatta. A new victory for Italian Peter skippered by the legendary Mauro Perlaschiar, after beating the Majorcan boat Mercury of Jordi Cabau by 8:25 minutes of advantage, and moving back away the French boat Irina VII in 33 minutes. After repeating yesterday’s results, the Peter is first in the general classification with 2 points, while Mercury sums 4 and Irina VII 6 points. The Classic 2 fleet is the one that has suffered the most from the consequences of the wind after sailing more miles with the more calmed final part, which has lead to several dropouts. Argos of Barbara Trilling repeated victory with more than 30 minutes advantage over the Margarita and the Altamar. The fourth and last classified, Diana, needed 6 hours and 13 minutes to complete the course, in a demonstration of effort and sportsmanship. After day 2 competition, Argos consolidates the leadership with 2 points, followed by Altamar with 5 points, Margarita with 6 and Diana with 7, which predict an interesting last regatta to complete the podium of the category.